Each piece of wood is unique, even within a species every piece is going to differ from each other. The grain pattern, color, weight, and density are all variable. However this does not make one piece better or worse than another, it simply means that they are different and unique. The sonic properties of wood vary dramatically between species, weight and density. In general, heavier woods have greater sustain and have a bright, clear well rounded voice. Light weight woods, while a practical choice for a player with a bad back, can sound indistinct or muddy especially with humbuckers. Medium weight woods fall in the middle and are the popular choice as they have a good balance of lows, mids, and highs. Compromises may be made by chambering or hollowing the heavier woods which creates bodies that remain stiff but light weight for that fat, rich, organic tone while preserving that great sustain! Hard Maple is a very hard, heavy and dense wood. This is the wood that is used almost exclusively for our necks and a popular choice for fretboards. The tone is very bright with long sustain and a lot of bite. A popular fingerboard wood, Indian Rosewood has the warm rock-n-roll tone you hear on some of the most famous rock albums in history. The warm tone is also a favorite amongst blues players. Rosewood’s feel is smooth and fast. Colors range from brown to dark purple to lighter purple with yellows and sometimes hues of orange and green. Very hard, smooth and fast feeling, it has a bright, long sustaining tone. Chocolate brown or dark gray streaks are not uncommon. Ebony has a long history of a preferred fingerboard choice of high-end electric and jazz guitar builders. Luxurious coloring and grain patterns are the earmarks of Walnut. This is an open grained wood. Walnut is in the heavy weight category but it’s not quite as heavy as hard maple. It has a similar sound to hard maple but it tends not to be as bright. Cherry is a wonderful wood that isn’t overly used in the guitar world. The tone is somewhere in the range of maple and walnut: not as transparent as maple, not as dark as walnut. It has a nice bass response, but a relatively quick decay like what one would find with maple. Can be moderately figured, with curly being most common. Bright vivid orange color which oxidizes to a warm brown with use. This waxy feeling wood has an open grain texture similar to rosewood and a tone similar to maple with great mids and attack. This is a heavy to medium weight wood. A very strong stiff wood. it provides bright midrange and a thick well defined bottom. Bodies made form Bubinga will be very heavy but will sustain for days. Western Maple grows around Washington, Oregon, and British Columbia. It is usually much lighter weight than Hard Maple but it features the same white color. It has bright tone with good bite and attack, but is not brittle like the harder woods can be. flame (fiddle-back) and quilted bodies are Western Maple. This type of maple works great with dye finishes. This is a lighter weight wood normally producing Strat® bodies under 4 lbs. The color is white, but often has nasty green mineral streaks in it. This is a closed-grain wood, but it can absorb a lot of finish. This is not a good wood for clear finishes since there is little figure. It is quite soft, and does not take abuse well. Sound-wise, Basswood has a nice, growley, warm tone with good mids. A favorite tone wood for shredders in the 80s since its defined sound cuts through a mix well. Swamp Ash is a fairly light weight wood. Many of the 50’s Fenders were made of Swamp Ash. The grain is open and the color is creamy, and is a very nice choice for clear finishes. It is a very musical wood offering a very nice balance of brightness and warmth with a lot of snap. Alder is used extensively for bodies because of its lighter weight and its full sound. Its closed grain wood. Alder’s natural color is a light tan with little or no distinct grain lines. The tone is reputed to be most balanced with equal doses of lows, mids and highs. Alder has been the mainstay for Fender bodies for many years and its characteristic tone has been a part of some of the most enduring pieces of modern day contemporary music. Premium quarter sawn Sitka spruce hails from Sitka Alaska. It is used for acoustic and archtop guitar tops. Lightweight but stiff, the color is creamy white. Flame, Fiddle-Back or Tiger maple all generally refer to curls as illustrated here. Flame can be tight, wide, straight or crooked. this wood is most beautiful in the form of a bookmatched carved top. 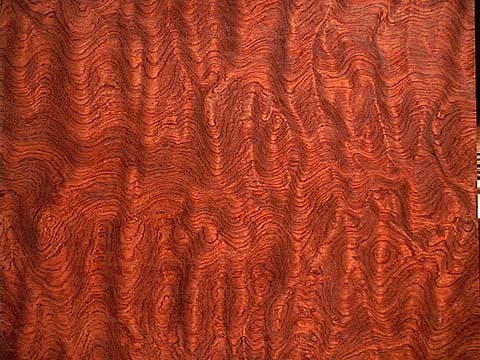 Quilted maple is a more rare form of figure occurring mostly in western maple. It is distinguished by its lofty cloud or even watery appearance. This figure can vary from large, wide billows to tight small blisters. quilted maple is most often used as a bookmatched top. A gorgeous exotic wood with rich grain covering a range of colors and patterns. These bodies dominate the heavy wood category with solid bodies always weighing in at well over 6 lbs. Specifying construction as hollow or chambered build is always a good idea if weight is a concern. big warm tones with smooth high end roll off. Indian Rosewood bodies were popular in the 70s by George Harrison of the Beatles. This very beautiful wood comes exclusively from Hawaii making supply very limited. Its weight varies somewhat from medium to heavy and is an excellent tone wood for bass guitar bodies. 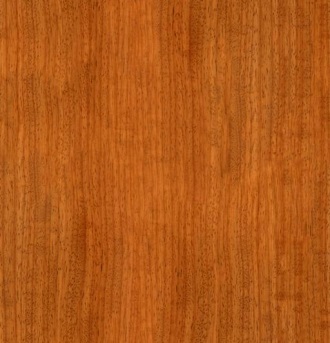 Koa has a warm sound similar to mahogany, but with a little more brightness. Koa is exceptionally beautiful when it develops the flame figure. Very rarely available. Luxurious coloring and grain patterns the figure is predominantly flame. Walnut is in the heavy weight category but it’s not quite as heavy as hard maple. It has a similar sound to hard maple but it tends not to be as bright. Available as bookmatched back and side for archtops, and occasionally as a two piece body blank. A very strong stiff wood. it provides bright midrange and a thick well defined bottom. Bodies made form Bubinga will be very heavy but will sustain for days. Figuring varies in color and intensity. Premium Flame, best quartersaw! This is the top of the heap in curly maples. Flame can be tight, wide, straight or crooked. Mastergrade says it all! Master grade Quilted maple is a highly rare form of figure occurring mostly in western maple. This figure can vary from large, wide billows to tight small blisters. Master grade Quilted maple is often used as a bookmatched back and side set for archtop guitars and also make stunning carved tops which really pop under finish!